As far as inbound marketing goes, it isn’t just a promising methodology or something we’re waiting to see work over time. The results of inbound marketing strategies have, to this day, provided businesses of all types with top notch results and it doesn’t look like it is slowing down anytime soon. Inbound marketing is the tried and tested result of online marketing evolving. The idea is very simple, after years of pushing content and advertising to consumers a few factors have always pulled the best performance. These factors are – highly targeted, well research target audience personas and providing these consumers with curated, educational, stimulating and problem-solving content. At its most basic level, this is what inbound marketing is. Invasive, short-term advertising practices are being ignored by people on the internet. Creating cutting-edge content that has longevity and builds brand trust with customers is what is working. They read the content for longer and are willing to partake in an extended conversation with the brand that increases the chances of them being converted into leads. Inbound marketing attracts the kinds of visitors and leads you want. Inbound content has been very well researched and tailor made to specific customer personas. Leads generated through inbound marketing are informed, interested and want to continue the conversation with your brand. Inbound marketing keeps visitors interested by offering insight driven, problem-solving content. The longer someone engages with your brand the more likely they are to give you their information and turn into a lead. Content creation results in further social media shares and backlinks to your website which both attracts more of the visitors you want and increases your website ranking. Are your online marketing strategies setup to deliver the best results? Developing an inbound marketing strategy that continually delivers results is no easy task. Especially when there are so many different digital channels to consider and optimise. 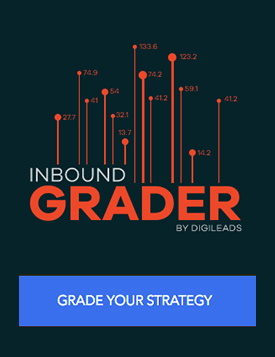 We’ve developed a great inbound marketing assessment tool that will help you quickly benchmark your campaign and see if it’s going to provide you optimum results. 12 statistics that show inbound marketing is the future of online marketing. We only feel its right to follow this short summary with the proof that’s in the inbound marketing pudding. Below are 12 great statistics that show the impact, benefits and return on investment that inbound marketing is already achieving for countless brands that are dedicated to its practice. Social Media B2B has published statistics to show that B2B companies that publish blog articles generate on average 67% more leads per month. Having an active blog will naturally generate more traffic, and having it as apart of an inbound marketing strategy will connect you significantly more with your customer base. The Content Marketing Institute shows that 8 out of 10 people consider themselves as regular blog readers and say they spend 23% of all time online on social media sites. People enjoy reading content that is consistent of a high standard, information-rich, educational and on a topic, they know they will enjoy reading about! Sharing blog posts on social media aren’t slowing down anytime soon either. Blogs give websites 434% more indexed pages and 97% more indexed links according to publications by ContentPlus. These numbers can’t be ignored and because indexed links and an indexed page directly translate into higher search engine rankings you will be getting a whole lot more website traffic. Search Engine Journal has stated that leads generated through inbound sources cost 60% less than those generated through outbound sources. One factor that contributes to this is the quality of audience member converting into a lead through inbound marketing – they are informed, engaged with the brand and have been interacting with the branded content over long periods of time. Content Marketing Institute and Marketing Profs worked together to provide a report that states that 61% of B2B marketers rate webinars as the most effective content marketing tactic. Educational content receives high engagement and it is important that you have such content in all stages of your sales funnel; bottom, middle and top. The Content Marketing Institute reported that 80% of business influencers and decision makers choose to get company information from a series of articles as opposed to advertisements. It is clear that people want information sources that they trust that are not only trying to sell to them, but rather educate and empower them. Hubspot has published that brands who have prioritised business blogging are 13 times more likely to enjoy positive inbound marketing returns on investments. According to Kapost – businesses that use inbound marketing strategies and content platforms that offer buyer persona-driven content are rewarded with a 45% increase in the volume of Sales Accepted Leads (SALS). Eloqua stated that after 5 months of consistent Inbound Marketing the average cost per lead decreases by 80%. As a long-term marketing initiative, inbound strategies do not only connect you with customers but increasingly raise your ROI the longer you commit to them. The Annuitas Group said that nurtured leads make 47% greater purchases compared to non-nurtured leads. Hubspot says that, on average, companies that publish 15 blog posts per month convert 1,200 new leads per month. When it comes to the inbound marketing, all you need to do is look at the statistics. When used correctly the fruits of your labour are rewarded over and over again. Are you generating leads correctly? Take our free online marketing assessment to find out. What Are the Best Inbound Marketing Tools?